While the term and concept of the Nexus Approach has been increasingly discussed since, there is no single universally recognized definition of the Nexus Approach in international academia to date. Instead, concurrent definitions are in usage, with partly overlapping, partly diverging foci. In this article, UNU-FLORES sets forth its definition of the Nexus Approach. When looking at the before mentioned nexus of water, energy, and food security, the question arises which environmental resources have to be managed in an integrated way to achieve the sought integrated and sustainable management. For UNU-FLORES, these environmental resources are: water, soil, and waste. The production of food relies on water and soil, with waste being an important factor for the provision of nutrients and other organic material. The same is true for the production of biofuel and energy from biomass. 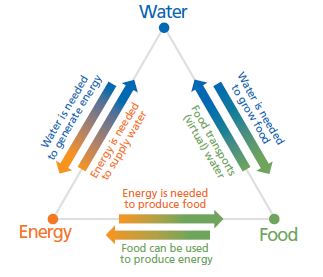 Additional links to energy exist for water (hydro power, conversion from heat to energy, cooling water) and waste (biogas, thermal energy from waste). The nexus perspective emphasizes the inter-relatedness and interdependencies of these environmental resources and their transitions and fluxes across spatial scales and between compartments. Instead of just looking at individual components, the functioning, productivity and management of a complex system is taken into consideration. In such complex systems there are trade-offs as well as facilitation and amplification between the different components. Even independently from the nexus of water, energy and food security, the nexus of water, soil and waste is evident: One example is soil transferring run-off and percolation to the “blue” water (surface and groundwater). “Blue” water in turn is transformed by soil into “green” water that plants use for their growth. Soil also contributes to the transformation of waste from crops, animals and trees into humus and plant nutrients, and provides plants with these for growth. The application of sludge on soil is also an important source of nutrients and organic matter. Human use of water creates “grey” and “black” waters which can be recycled through purification and used as source of plant nutrients and converted into “blue” and “green” water by denaturing and filtration through soil. Integrated management concepts have been used in the individual areas of water, soil, and waste for years. However, the close relationships, interactions, and interdependencies between these resources are usually not taken into consideration when integrated resource management concepts are developed. Yet fixing one challenge in managing one resource often creates challenges for other resources. A better solution can be achieved if these resources are managed collectively using a nexus approach. The integrated and interconnected management of water, soil and waste can increase resource use efficiency while at the same time environmental risks and ecological degradation can be minimized. 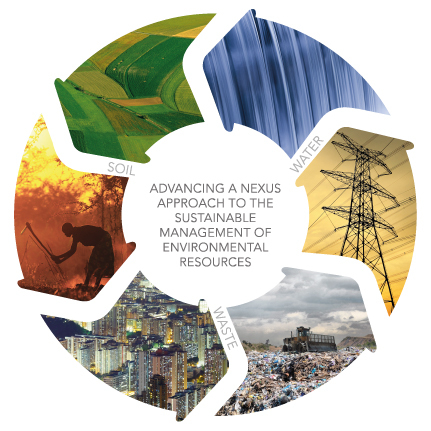 In addition, the nexus approach not only emphasizes the inter-relations of resources, but, given the focus on management, considers also the cycle from research to implementation, thus focusing on governance, the enabling environment as well as on individual capacity development. The nexus approach to the sustainable management of water, soil and waste promoted by UNU-FLORES is thus closely related to the water, energy and food security nexus, looking at it from an environmental resources perspective. It is instrumental to meet the current challenges of growing resource demands, climate change, urbanization, and globalization. Advancing a nexus approach requires concerted action and cooperation on a global level and across sectors to address the knowledge gaps via well-defined nexus research programs. Also, the nexus approach yet has to find its way into the curriculum of respective study programs. For a sustained follow-up to the nexus initiative, a long-term commitment of leading institutions and thus an institutionalized support is indispensable. Besides addressing knowledge gaps and the need for better scientific understanding, advancing a nexus approach requires special attention in regards to the requirements for the implementation of a nexus approach outside the academic circles. Examples of good and improved governance resulting from adopting a nexus perspective are rare. Knowledge issues and education (individual capacity development) must be addressed as well as the organizational level and the enabling environment and systems level (institutional capacity development). UNU-FLORES is a direct response to the nexus initiative, striving for an integrative approach to the management of water, soil and waste (closely related to the water, energy and food security nexus, see above). An asset of the institute is its integration into the research environment in Dresden and Saxony as well as its strategic positioning within the thematic areas of the UN University. UNU-FLORES will extend and upscale the concept of integrated resource management through adopting a truly integrative perspective by considering inter-related resources and emphasizing fluxes of resources between phases and compartments. Instead of following a traditional input-output model that shows how parts of a system are affected by a change in another part of that system, UNU-FLORES explores whether the consistent tracing and management of resources as fluxes will result in sustainable management outcomes. The complex relations between demand, resource availability and quality, and financial and physical constraints can be addressed by knowledge-based policies and reform of professional practice. The nexus approach recognizes the urgent need for this knowledge and its interpretation in a policy-relevant setting. This need derives from the understanding that there is a lack of blueprints for development based on integrated management of water, soil and waste resources both in developing and in developed countries. UNU-FLORES will pursue the achievement of sustainable environmental outcomes by serving as a think tank that promotes integrated resources management in all countries. Hoff, Holger. 2011. Understanding the NEXUS. Background Paper for the Bonn2011 Conference: The Water, Energy and Food Security Nexus. Stockholm: Stockholm Environment Institute. Huelsmann, Stephan, and Reza Ardakanian, ed. 2015. White Book on Advancing a Nexus Approach to the Sustainable Management of Water, Soil and Waste. Dresden: UNU-FLORES. Lal, Rattan. 2013. The Nexus of Soil, Water and Waste. UNU-FLORES Lecture Series No. 1. Dresden: UNU-FLORES. Sachs, Ignacy, and Dana Silk. 1990. Food and Energy: Strategies for Sustainable Development. Tokyo: The United Nations University. Kurian, Mathew, and Reza Ardakanian, ed. 2015. Governing the Nexus: Water, Soil and Waste Resources Considering Global Change. Switzerland: Springer International Publishing. Hettiarachchi, Hiroshan, and Reza Ardakanian, ed. 2016. Environmental Resource Management and the Nexus Approach: Managing Water, Soil, and Waste in the Context of Global Change. Switzerland: Springer International Publishing.